Bradbenken 2, located about 300 meters from Bryggen, towards the cruise ship terminal. Please look for the sign and the RIB-boat. SEE MAP HERE or HERE. Take a fjord safari with RIB-boat for a unique and exciting way to experience Bergen. See the city from a new perspective, on your very own RIB-boat adventure! The excitement begins the moment you meet your Captain, who will introduce you to your rigid inflatable boat (RIB), provide you with a safety briefing and kit you out with your special survival suit. Then it’s time to take your seat and let the activity commence. First a gentle cruise around the city and harbour will introduce you to the highlight sights of Bergen. From the water you can see the famous Hanseatic area of Bryggen and its colorful wooden-fronted houses that have been recognized by UNESCO. You can spot the 7 hills that surround the city and witness the bustling activities in the harbor. Moving away from the city and into the open fjords the pace will soon pick up. The scenery swiftly changes as the cityscape is replaced with views of tiny skerries and offshore islands, some of which are linked to the mainland by huge suspension bridges. Out on the open waters, you’re bound to experience an adrenaline rush, as your Captain revs the engine and takes you on a thrilling high speed journey. An exciting and memorable way to view the sights and surroundings of Norway’s second largest city! 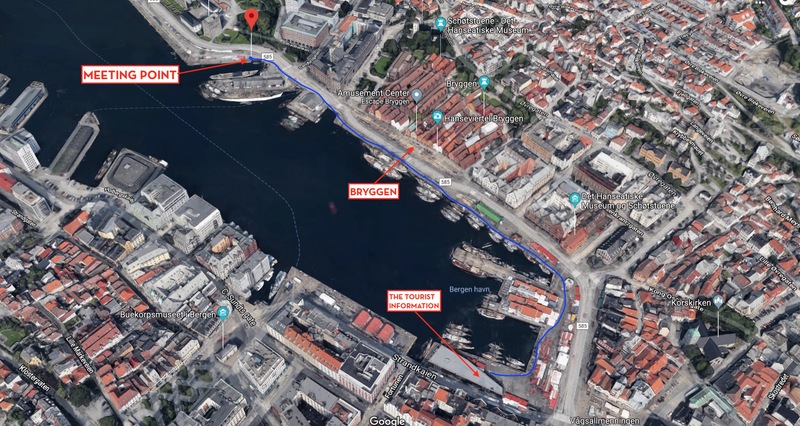 Meeting point: Bradbenken 2, located about 300 meters from Bryggen, towards the cruise ship terminal. Please look for the sign and the RIB-boat. SEE MAP HERE or HERE. Wear practical outdoor clothes and shoes, and bring sunglasses. No heals, please! Please note: You can buy tickets directly at the boat before departure. Bergen is known as "the gateway to the fjords" and a stop in Bergen is included in most of our tours. If you book one of our tours, you can add this activity in the booking process.